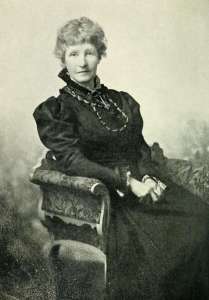 Helen Allingham was born as Helen Mary Elizabeth Paterson in Swandlicote in Derbyshire as the first of seven children to physician who died when she was in her early teens. By this time Helen’s family already aknowledged and supported her artistic talents. After father’s (and one of sisters’) death the rest of the family moved to Birmingham. At 18 she secured her place in Royal Academy Schools, a prestigious place which was for very long time opened only for male artists. It was Helen’s aunt Anne Laura Herford, who applied for admission with her works signed only with initials and convinced commission to open the door to all female artists with quality of her paintings (and a lot of determination). Helen Paterson flourished under the guidance of established painters as Frederick Leighton, John Pettie, Fred Walker and especially John Everett Millais, one of the founding members od Pre-Raphaelites. Before she finished her schooling, she knew she could make a living with her art, but the market wasn’t ready for colors. 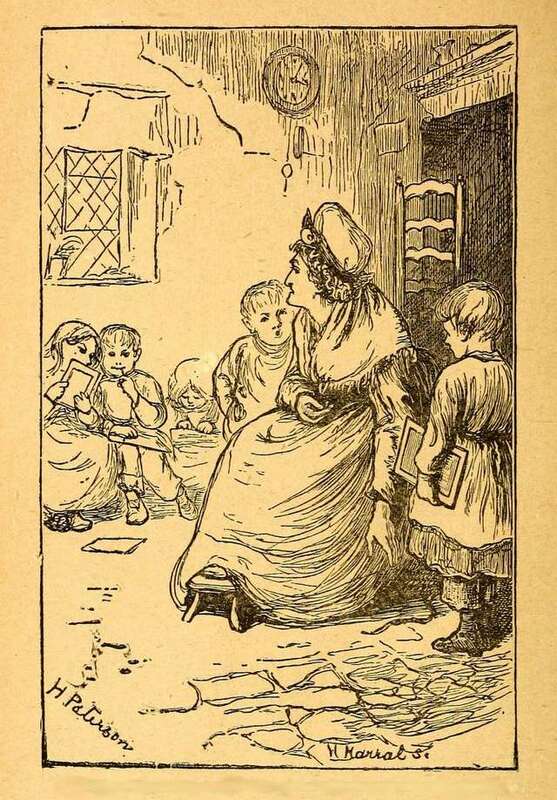 Helen found a lot of work in London with numerous publishers of cheap magazines, periodicals and illustrated books. It was still time of wood engraving, but also a chance to hone her artistic and business skills. A bit of repayment for both came with The Graphic in 1870, one of the first of its kind: weekly magazine with high quality illustrations. She was a founding member at magazine with refreshing editorial and business policy. 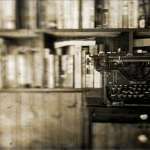 They didn’t offer jobs to just anybody in the workplace, but carefully considered which artist is best for every particular assignment according to his or her style . They even offered half of payment in shares what soon proved as one of most profitable investments of the time. Helen Paterson secured a position with regular illustrating jobs with payments way above the average. 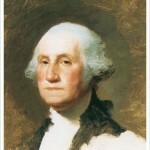 Apart from that she also got commissions for books written by Thomas Harding, George Bell and Juliana Horatia Ewing. 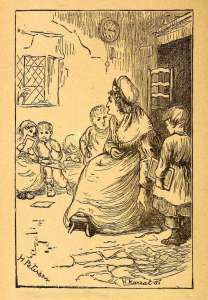 She left the school, but still visited evening classes where she met and befriended another talented water-colourist Kate Greenaway, and, while constantly expanding her social network, also met her future husband William Allingham, editor and poet who was almost quarter of a century older. 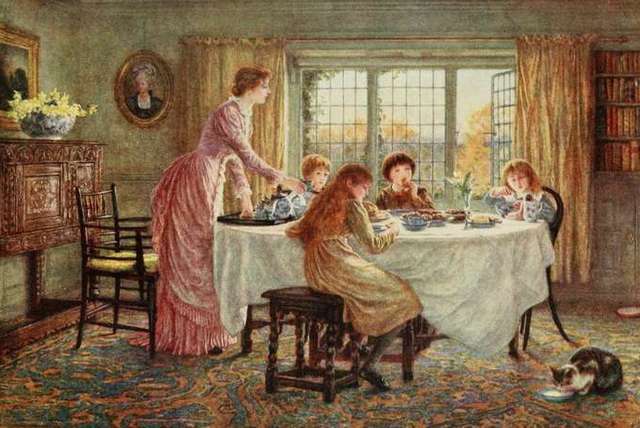 He introduced her to some of the leading names in literary circles including John Ruskin, Dante Gabriel Rossetti, Robert Browning, Thomas Carlyle and Lord Tennyson, made several portraits of some and Allinghams even named their first son after Carlyle. Helen finally had a chance to completely abandon black and white drawings and devoted herself to her biggest love, the watercolors. She made another important switch. Instead of portraits and figures (members of her growing family proved as great models) she started to make more and more landscapes what was considered as a step back in artistic career in those days. Especially her paintings of cottages became very popular and new home in Sandhills offered plenty of opportunities for short trips with astonishing views. William was writing, Helen painting, children growing. Unfortunately an idyll can’t last forever and this one was no exception. 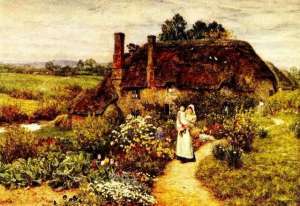 In 1889 William died and Helen Allingham had to earn everything needed to support the family by herself. 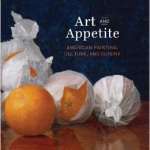 She worked hard, sold many paintings for pretty good sums of money and became elected member of Royal Society of Watercolor Artists as first woman in history. 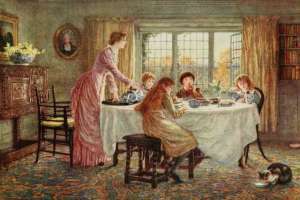 She never became rich, or popular as another of her collegues Myles Birket Foster, but managed to provide good living to her and her family, and worked what she liked most – painted to the rest of her life in 1926. Mrs Allingham’s cottages are part of English cultural heritage and no collection of water-colors can not be completed without at least one of her works. They are not only praised for her sense of line, proportion, colors and contrasts, but as important and (what is not necessary a bad thing) very sentimental record of disappearing architecture. 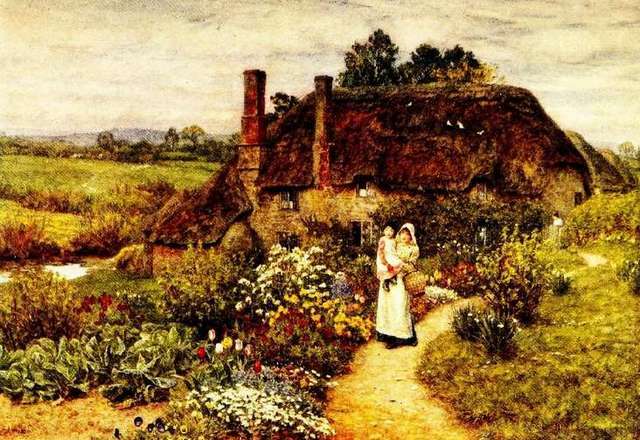 You can see more about Helen Allingham’s cottages here.